This column was originally published on Justine PETERSEN's "Just Saying..." blog. So had I. I was woefully unprepared for my role at the warehouse. My four years of liberal arts studies taught me to think critically about race, gender, class, history, and language and to advocate for social justice. That training was of little practical use on the warehouse floor. My time there was a perpetual scramble and a blur of humbling experiences. But the community of workers I’d stumbled into helped me assimilate anyway, and they called me out when I needed to hear it. In exchange I tried my best to be a sponge, which wasn’t usually a fair trade. Many years and a career pivot later, as I continue learning the shape and substance of community development work in St. Louis under the guidance of many equally generous mentors, I’ve seen shades of this pattern play out in other contexts. Sometimes, as professionals or volunteers working in communities that aren’t our own, we arrive unprepared to do the work we think we want to do. Economist F.A. Hayek argues that human society is wholly dependent on an “extended order” that most of us rarely stop to think about. From infancy, we learn how to navigate the world by watching and imitating the people around us, and thanks to our accumulated customs, we’re able to collaborate in broad, powerful ways even though none of us can see the entire system all at once. At the heart of the extended order is the tenet that every human being has access to local knowledge and circumstantial expertise that others do not—and that these unique insights, which can frequently benefit society as a whole, can only be used if the decisions that depend on them are left to that person or are made with his or her active participation. We don’t always honor this reality when we set out to do community-based work. Sometimes, we burst in with well-intentioned plans and ideas before asking whether the members of that community want to hear them, or use them. Sometimes, as we look for ways to apply our research-based, data-driven knowledge, we forget to listen for the knowledge and insights that community members bring to the table. We forget that a community is not a project. A community is a living, breathing ecosystem that cradles a whole host of sacred things: history and memories, friendships and love, suffering and trauma, layers and layers of stories. When we commit ourselves to community-based work, our ultimate job—should we be lucky enough to be invited to sit at a community’s table—is to begin learning those grooves and to help draw out, build up, and connect what’s already there. That’s the heart of asset-based community development, and as a new(ish) practitioner, I’m grateful to be learning from the many, many people and organizations across St. Louis who have taken up this mantle and are leading by example. And to learn, we have to listen. Really listen. That means arriving fully prepared to change our minds and adapt our approach after taking in what’s been said. When a community shares an experience or insight with a visitor, it’s a gift. It should be honored. If we want to serve, our community-based work has to be a conversation and an exchange before it can grow into anything else. Jenny Connelly-Bowen is passionate about work that builds strong, inclusive communities. She currently serves as Executive Director for the Community Builders Network of Metro St. Louis. Jenny has a B.A. in English from Beloit College and a master’s degree from UMSL in Public Policy Administration with certificates in Nonprofit Management & Leadership and Policy & Program Evaluation. Prior to entering the community development field, Jenny spent over five years working in distribution, buying, and pricing at Save-A-Lot Food Stores. She believes in the power and potential of stories to build bridges and break through walls and is committed to cultivating a sense of place and purpose in her work. This column was originally published by The Conversation in May 2018. The latest federal effort to revitalize impoverished parts of the country using tax incentives is beginning to take shape. Unfortunately, if history is a guide, it won’t work. New York, New Hampshire and Florida are among the latest states to nominate low-income neighborhoods for the new Opportunity Zone program, created as part of the tax law passed late last year. They hope to join the 18 states already in the program, which offers investors a big tax break in exchange for plowing money into areas designated as opportunity zones. The program’s backers claim this will reduce poverty, increase employment and spur growth. However, research conducted by myself and others shows that this approach tends to fail. At the heart of the Opportunity Zone program is the simple idea that tax incentives for investors will transform declining areas into thriving economic hubs. This is based on the faulty notion that urban or rural deterioration results from excessive taxation undermining capital investment. Specifically, the program lets investors avoid the usual tax on capital gains by putting their profits into so-called opportunity funds, an incentive that lasts until 2026. At least 90 percent of the assets in such funds must be invested in designated low-income zones, which are based on statistical geographic subdivisions known as “census tracts.” Other incentives kick in if the investment is held for at least 10 years. This approach is nothing new. In the 1980s, Margaret Thatcher’s government first tested the idea by creating 11 “enterprise zones” in the U.K. that offered a range of tax breaks and regulatory relief. The most famous of these was in London’s dilapidated docks—including Canary Wharf—which soon after underwent a dramatic transformation and is now home to many of the country’s major financial institutions. Because it showcased the apparent virtues of the free market, the enterprise zone idea quickly crossed the Atlantic and attracted the interest of conservative politicians and thinkers in the United States, such as Brookings Institution policy analyst Stuart Butler—formerly of the Heritage Foundation—and then President Ronald Reagan. More than 40 U.S. states eventually created these zones, which offer a range of incentives, such as tax relief and job training. Both programs have since expired. Numerous efforts have been made to assess the effectiveness of such zones, both in the U.S. and the U.K. On the whole, scholars have reached the strikingly similar conclusion that the programs did not work, at least not as hoped. In their exhaustive study of 75 enterprise zones in 13 states, Alan Peters and Peter Fisher, professors of urban and regional planning, found that the tax incentives had “little or no positive impact” on economic growth. In my own research on Philadelphia, I found that the effect of empowerment zones was negligible. The places inside the empowerment zone boundaries actually fared worse in terms of income and employment growth when compared with similar census tracts. They were only marginally better in terms of reducing poverty, which was still more than a third of the city’s households in 2007, over a decade into the program. Opportunity zone advocates, meanwhile, have pointed to states like New Jersey and Indiana as examples of success. However, one study suggested that increased economic activity in zones in New Jersey came at the expense of non-zone areas nearby, while an analysis of the Indiana program suggested that the incentives encouraged a switch to less productive forms of economic activity. In the U.K., supporters of the enterprise zone program highlight the London Docklands, which went from a derelict port to a thriving financial services hub. Yet government studies showed that relatively few jobs were created and that each one cost US$35,000 to $45,000 in spending and lost revenue. And my own research shows that despite these gains the area is still home to some of the most “income deprived households” in the U.K. The goverment’s recent effort to revive the program created 29,000 jobs as of 2017, just half the number it promised, at a cost of about $3 billion. Despite the lackluster performance of the tax incentive approach in terms of job creation and poverty reduction, the idea continues to attract support on both sides of the Atlantic and across the political divide. Sadly, these policies almost inevitably result in tax giveaways for investment that would have occurred anyway, as we’re beginning to see with opportunity zones. Under such circumstances, displacement from gentrification is the likely result. 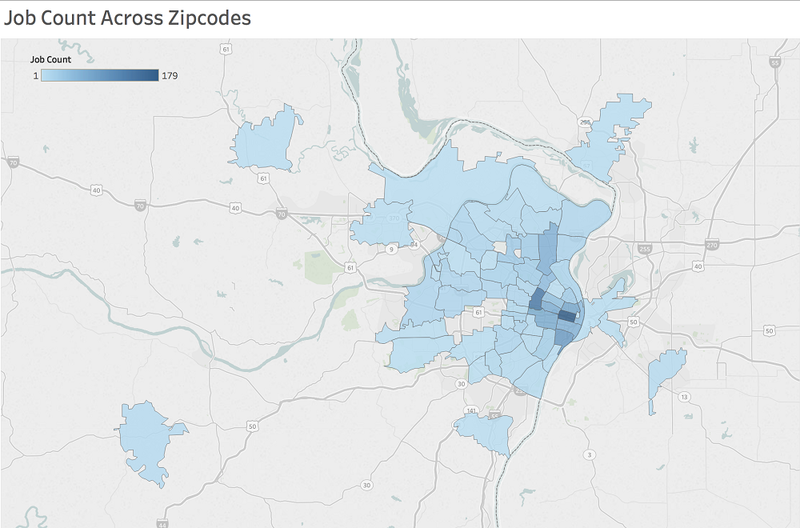 For example, in Louisville, Kentucky, the central business district and the fast-gentrifying tracts of Nulu, Butchertown and Portland were deemed opportunity zones despite having already seen major capital investment in recent years, yet seven of the 18 poorest tracts were not. So what might work to revitalize poor neighborhoods and help the 40.6 million Americans in poverty? While there’s no panacea, I argue policies that enhance what I call urban social citizenship and empower people to invest in their communities would be far more successful than tax breaks for investors. Timothy Weaver is an Assistant Professor in the Department of Political Science at the University at Albany, SUNY. He is author of Blazing the Neoliberal Trail: Urban Political Development in the United States and the United Kingdom (University of Pennsylvania Press, 2016) and has published articles in Urban Studies, the Urban Affairs Review, and New Political Science. This column was originally published by Next City. The recently-released Opportunity Atlas provides fresh evidence that neighborhoods—even blocks within neighborhoods—are determinants of children’s life chances, even when families have similar incomes. Similarly, the Neighborhood Life Expectancy Project shows how disparities in health, block by block, are based on neighborhood conditions. These new reports are a reminder that the streets we call home—even more than the cities, counties, towns and suburbs we live in—are major predictors of quality of life and life opportunity. Given this growing understanding of how neighborhoods affect life outcomes, why aren’t more policymakers, civic and private leaders turning their attention to them? Like Goldilocks tasting porridge, middle neighborhoods are not the strong, pricey places with fast appreciating housing markets (too hot); nor are they full of vacancies, distressed buildings and very low housing prices (too cold). Instead, middle neighborhoods are those just-right places where home prices are generally affordable to the average household. But, these neighborhoods are often on the edge between growth and decline. Despite the fact that they are a source of naturally occurring affordable housing [NOAH], and that they have played an important role building opportunity and prosperity for their residents, this category of neighborhoods gets barely any attention. Middle neighborhoods house a third to half of urban America in the cities we’ve examined. Many are home to predominantly African-American families, such as Greater Chatham in Chicago, Belair-Edison in Baltimore and Lee Harvard in Cleveland, while others such as Slavic Village in Cleveland trace their roots to Eastern European immigrants. Many others are among the most racially and socioeconomically diverse in the nation. These are neighborhoods that were once in proximity to jobs, which is why they have historically housed working-class and middle-class families. Today, many of these neighborhoods fight to avoid decline because they are no longer near jobs, and, in many cases the existing housing is now less attractive to important market segments than it once was. Given the narrow market and the scarcity of capital for owners to upgrade these homes, as well as a housing market that favors new construction, many homes in middle neighborhoods struggle to compete for buyers. In recent decades, these places have been largely ignored. Many of us have seen and read the economic and demographic trends for years: the loss of our middle class, the economic and racial segregation of our neighborhoods, the decline of decent jobs with growth ladders. Yet we have failed to take assertive action to protect these neighborhoods, which are more diverse than many others and which house modest-income Americans. Two years ago, The American Assembly, a national policy institute at Columbia University, published On the Edge: America’s Middle Neighborhoods, in partnership with the San Francisco Federal Reserve Bank. The book highlights the challenges facing middle neighborhoods and the many local efforts underway to keep these neighborhoods from falling into decline in weak marketplaces such as Baltimore and Cleveland, and from gentrifying in strong market cities such as the San Francisco Bay Area and Washington, D.C. In the wake of the book’s rollout, a growing number of practitioners, advocates, lenders and community-based organizations are sharing their experiences and insights about how to take purposeful steps that safeguard their middle neighborhoods. Mayors, city councils and planning directors are taking notice, and in some instances even leading the way. The rationale is simple: because middle neighborhoods provide a substantial portion of property tax revenues, local governments must take action to stabilize them to protect the tax base. Their efforts are aimed at preventing decline — a danger in many cities — and the dramatic loss of home equity when property values decline or do not keep abreast of inflation. The learning that has occurred in the past two years is very heartening. There are successful efforts in some cities to strengthen these neighborhoods by building more capacity within the neighborhoods, marketing these hidden gems to market segments that have been ignoring them and retrofitting homes to make them more attractive in today’s markets. The Healthy Neighborhoods Program in Baltimore has been working for 15 years to stabilize 42 middle neighborhoods in that city through a loan pool of mostly private lenders. Philadelphia City Council passed legislation allowing for a new home repair loan program that has income limits high enough that residents of middle neighborhoods can use the program to improve their homes. In late September, the Des Moines City Council introduced a multimillion-dollar pilot for four neighborhoods, which if successful, will be rolled out citywide. These independent efforts are now finding each other through a middle neighborhoods Community of Practice. This peer-driven self-help group of practitioners is helping to focus attention on two of the most important issues driving middle neighborhood stabilization efforts: boosting the capacity of practitioners and local community-based organizations and finding ways to increase access to financing. We have been encouraged by the growing attention to this class of neighborhoods and the work underway in a growing number of cities to use “an ounce of prevention” to keep these neighborhoods from falling into decline or gentrifying uncontrollably. State and local governments play a key role, as does the private sector, including major local institutions, such as hospitals, colleges and universities. But they cannot do it alone. The stakes are too high. These neighborhoods need attention if they are to remain capable of fulfilling the needs of tomorrow’s generation. Paul C. Brophy is a principal with Brophy & Reilly LLC, a consulting firm specializing in inclusive economic development and neighborhood improvement in legacy cities; the management of complex urban redevelopment projects; and the development of mixed-income housing communities. Mr. Brophy has directed three projects for the American Assembly, where he is a senior advisor. In 1997 Mr. Brophy led a project that resulted in a widely-read report, “Community Capitalism: Rediscovering the Markets of America’s Urban Neighborhoods.” In 2007, he conducted a project that produced the report, “Retooling for Growth: Building a 21st Century Economy in America's Older Industrial Areas. And, in 2011, he co-directed a meeting that led to the report, “Reinventing America’s Legacy Cities: Strategies for Cities Losing Population.” Brophy is also a senior advisor to Enterprise Community Partners and is an adjunct professor at Georgetown University’s School of Urban and Regional Planning. He was previously a Non-Resident Senior Fellow at the Brookings Institution, a Senior Advisor to the Center for Community Progress, and a Senior Scholar at the George Warren Brown School at Washington University in St. Louis. Brophy edited “On the Edge: America’s Middle Neighborhoods” (2016), and is co-author of three books: “Neighborhood Revitalization: Theory and Practice” (1975); “Housing and Local Government” (1982), and “A Guide to Careers in Community Development” (2001). Frank Woodruff is executive director of the National Alliance of Community Economic Development Associations. He joined NACEDA in September 2010, becoming executive director in January 2012. During a time of significant political and economic challenges for community development, Frank saw this as an opportunity to take NACEDA to a new level of success and sustainability. He believes community and economic development will be a critical tool for those communities and neighborhoods that are organized, demanding, and capable of instituting change. He holds a Master’s Degree in Public Policy from The George Washington University. He also has a B.A. from the University of Wisconsin-Madison. His publications include: “The Mortgage Interest Deduction: an Example of Upside Down Federal Government Housing Subsidy,” and is co-author of two essays entitled “Redlining,” one in The American Middle Class: An Economic Encyclopedia of Progress and Poverty due to be published in 2015 and the other in The Wiley-Blackwell Encyclopedia of Urban and Regional Studies, due out in 2016. Like pizza and cheeseburgers, democracy is something everyone is supposed to love, right? Only nineteen percent of millennials feel it is illegitimate for the military to assume control of a country if an elected government is failing to do its job. Support for democracy has decreased every year since 2005. Globally, there are fewer democracies today than there were in the 1990s. It would be easy to dismiss this data as yet another example of how (allegedly) damaged and dangerous millennials are. However, dismissing the data doesn’t make the data go away. Dismissing the data also doesn’t deal with the fact that a decline in support for democracy is historically tied to the economy. In his book Fear Itself: The New Deal and the Origins of Our Time, historian Ira Katznelson writes that calls for a dictator to assume control in the United States during the early days of the Depression were relatively common. Walter Lippman, at the time America’s most influential journalist, wrote just prior to Franklin Roosevelt’s inauguration that “a mild species of dictatorship will help us over the roughest spots in the road ahead.” Alfred E. Smith, a popular former presidential candidate and governor of New York, said that in the face of the Depression the nation should wrap the Constitution in a “piece of paper and put it on a shelf” until the crisis had ended. The 1920s and ’30s show that a rejection of established political values can be the byproduct of the economic system not working for a significant percentage of the population. The decline in support for democracy over the last twenty or so years isn’t a coincidence, and it’s not a side effect of too many participation trophies, or whatever millennial stereotype one chooses to use. While the range of birth years for millennials has changed several times, the generation was originally defined as those who entered adulthood around the year 2000. If you entered adulthood around the 2000 (like I did), you have lived your entire adulthood and roughly half your life in an abnormal housing market. Your young adulthood began just as the housing market started to boom. In your mid to late twenties, the market crashed and brought the global economy to its knees. In the aftermath of the crash, developers stopped building, and as a result, your thirties have seen another booming housing market driven by a lack of available homes. Pre-recession, when the labor market was strong, wildly overpriced homes were purchased with exotic and ultimately toxic financial instruments. Today, housing is often unaffordable because there are just too few homes on the market. During the recession, when homes were cheap, unemployment was high and job security was low. Housing is about much more than just plywood, shingles, and mortgage insurance. Our perception about where we live, and why we live there plays a powerful role in our understanding of the world and whether we’ve gotten a fair shake in life. If an entire generation has lived its adulthood in a market where the only time housing was affordable was also the time when the labor market was the worst, a decline in support for existing economic and political systems is inevitable. Teaching people that democracy and capitalism are the best—and only legitimate—ways to structure a society only goes so far if those values are doing nothing to provide Americans with the basic necessities of life. That isn’t to say the alternatives to democracy and capitalism are preferable. What it does say is that the impact of a perpetually distorted and faulty housing market has a bigger impact than just keeping young people living with their parents longer. A lack of affordable housing and NIMBYism is not by any means the only reason for a decline in support for democracy, but given the central role the Great Recession has played in this century’s politics, it’s hard to argue that housing has nothing to do with the data in Mounk’s study. In the 1930s, the Roosevelt administration realized that saving capitalism and democracy might require intervening in the free market. If people don’t have the necessities of life—a safe home, food on their table, a job—they also don’t have a reason to support the system that makes obtaining the necessities so difficult, if not impossible. The data in Mounk’s research is troubling, but it shouldn’t be surprising. If we want people to believe in the political and economic values that form the foundation of our society, they need to have at least a fair shot at getting the basics we all need to survive the modern world. Dustin McKissen is a partner and co-founder at Clustered Economic Development. He is also a columnist for VentureBeat, Inc., Entrepreneur Quarterly, and CNBC, and a two-time LinkedIn Top Voice on management and culture. He holds a bachelor’s degree in public policy from Prescott College and a master’s degree in public management from Northern Arizona University. This column was originally published in The St. Louis American. Just a few miles from the shadows of cranes erecting luxury apartments and tax-financed commercialexpansion along St. Louis’ central corridor, the illusion of equitable development quickly evaporates. It is painfully obvious to tenants throughout the metro area, struggling to find healthy, well-maintained, and affordable homes, that our interests are shared by few. Profit-driven markets provide no motivation to deliver housing for all who need it. Decades of disinvestment in housing justice prove that local, state and federal institutions lack the will to boldly address the housing crisis. The report “Segregation in St. Louis: Dismantling the Divide” states that the injustices we see are particularly along racial lines with decades of racist housing policies. But we also know that we possess the power to change them. That power is called tenant organizing. Homes For All, a national alliance of affected people for housing justice, defines a tenant or renter, terms we use interchangeably, as someone paying rent or seeking to pay rent but without the resources to do so. This definition includes low-income homeowners, mobile home park residents, public housing residents, the homeless, and squatters. Tenants are directly affected by poor living conditions, rent increases, and the pressures of gentrification that lead to displacement. Standing together, we can combat these issues: Uniting against landlords or developers around properties and neighborhoods builds our power. An organized tenant union allows for independent and democratic decision-making, planning, and implementation of policy, based on a community—not a boardroom or bank account. In late July, tenants across the St. Louis region, from Ferguson to South City, gathered at the Deaconess Center for Child Well-Being and declared, “Housing is a human right.” Five months before this mass meeting, 40 tenants (mostly renters) gathered in a South Side learning center to voice their grievances about housing conditions. Twenty three days before, tenants of the Clinton-Peabody public housing complex held a public demonstration for better living conditions. From next door to next neighborhood to adjacent county, tenants are exercising their power and activating their neighbors to amplify their impact in their houses, the state houses and courthouses. Tenant organizing has played an important role in St. Louis’ history and helped shape today’s federal housing laws. In 1969, public housing tenants staged the nation’s first public housing rent strike, lasting nine months. Fighting back against unsafe housing conditions and increasing rental rates, tenants withheld $600,000 in rent from the St. Louis Housing Authority, nearly causing it to go bankrupt. This strike in St. Louis resulted in the passage of the Brooke Amendment, which set public housing rents to be no more than 30 percent of individual income. Today, organizations and activists in housing justice, constrained by the capacities of liberal reform, now proclaim their belief that the leadership of impacted people move movements. Guided by this ideal, Homes For All St. Louis was started by South City renters and low-income homeowners of Dutchtown South Community Corporation’s Community Empowerment Committee. They echoed concerns of neglected pest and maintenance issues, unresponsive landlords and a lack of enforcement from municipal departments. Homes For All St. Louis’ alliance of tenant unions set goals to enforce current tenant protections, one slumlord at a time, whether they be St. Louis Redevelopment Co. or Rutherford Group, and to reinforce municipal departments’ obligations to their most vulnerable populations. Housing is a human right. It should be built and maintained to meet the needs of communities, not to create profit for corporations or white suburbanites who have benefited from historically racist policies and who built their wealth off the backs of renters by extracting wealth from urban communities. The people most impacted must lead. This includes low-income and working class communities, black, indigenous, Latinx and Asian communities, women and LGBTQ communities who experience the impacts of the crisis first hand. Land and housing should be collectively-controlled by communities and sustained for future generations through democratic processes and stewardship. United with renters, low-income homeowners, homeless individuals, activists, social service providers, and housing justice advocates, this movement shouts out, “Housing is a human right!” and upholds that tenants possess the power to make that proclamation so. Interested in hearing more? Email us at h4astl@gmail.com. Sunni Hutton is the community development manager at Dutchtown South Community Corporation, whose Community Empowerment Committee launched the Homes For All St. Louis campaign. St. Louis Region is 21st Largest in U.S. – Now What? This column was originally published in the St. Louis Post-Dispatch. Earlier this year, the U.S. Census Bureau released its latest population estimates for the nation’s largest metropolitan areas. The St. Louis region grew, but our rate of growth was slower than those in other metro regions like Denver, Tampa, FL, and even Baltimore. As a result, we dropped from 20th to the 21st-largest metropolitan region. But let’s be clear: We are doing well in a lot of areas. This story is not about urban vs. rural, this suburb vs. that suburb. Every metropolitan region across the country is competing for people, jobs and economic opportunities. But what this news should do is inspire us, as business and civic leaders, to work together more effectively to market the St. Louis region and bring more jobs and talented people to our region. We do have a lot of momentum on which to build. This spring, we beat out Kansas City, Milwaukee and Louisville, KY, to win more than 2,200 new jobs with companies like Amazon, Cenlar and Grove Collaborative. Our startup businesses continue to grow and thrive, and we have more opportunities to encourage expansion. In March alone, St. Louis Regional Chamber of Commerce staff met with site selection consultants in Dallas and Cincinnati, and we are soon heading to Cleveland and Chicago. We hosted the consul general of India, who is committed to encouraging Indian companies to locate here in St. Louis. People, jobs and companies are moving to and interested in moving to St. Louis, but the more economic opportunities we can provide—in terms of jobs and a talented workforce—the more likely we can grow at a faster rate. The core mission of the St. Louis Regional Chamber is regional economic development. That means when a business is wanting to relocate its business, we look at all corners of the region—City of St. Louis, St. Louis County, St. Charles County, Madison County, St. Clair County and beyond. Each area has unique assets, and combining our strengths creates a region that is very competitive. Companies and site selection consultants tell us they love St. Louis’ educational opportunities and our strong talent in biosciences, financial sectors, health care, and logistics and advanced manufacturing. They appreciate our friendly business climate. And as many of us know, they cite affordability as a major selling point. According to the St. Louis Federal Reserve, we rank No. 7 in the country for adjusted real personal income per capita, 12 percent higher than the national average. That means a dollar goes further in St. Louis than almost anywhere else. The 2017 ACCRA Cost of Living Index indicates that our region’s composite index ranks at 90.6, where 100 is the average for the country. Affordability, educational opportunities and key industries are reasons why companies choose to do business in St. Louis. And we think many more will, especially as the chamber and community partners continue to work with regional educational partners and employers to grow and develop our workforce. It is important that we in the business and civic community work together to attract new people to St. Louis. Young professionals, immigrants and companies want affordable housing and commercial space to help their growing families and businesses. We should target the coastal cities to highlight our lower cost of living and housing and our other regional assets. We still have real challenges and perceptions to address, but we also need to get out there and tout our strengths. Ultimately, people and businesses are looking for economic opportunities. That is how St. Louis will grow. We must continue to work together to bring more jobs, build our workforce, and attract talented and innovative people. We also must support people and organizations that make St. Louis a better place to live. This is our call to action. We at the chamber will continue to work hard and collaborate with our partners in both Illinois and Missouri to market the region around the country and across the world. St. Louis has many assets, we are open for business, and it is time we assert the story of our region’s benefits. For more than 25 years, Tom Chulick championed regional economic growth as a financial services industry executive and a committed civic leader. Since March 2018, Tom has served the St. Louis Regional Chamber as President and CEO. Chulick is the former Chairman, CEO and President of UMB Bank in St. Louis. He specialized in business growth, commercial banking, brokerage, institutional asset management, wealth management and treasury services. During his tenure at UMB, the St. Louis Region market achieved unprecedented sales growth with a six-year compounded annual growth rate over 24%. Tom led a successful turnaround in three markets and as a result, his model became the UMB Bank standard. During his tenure, Forbes Magazine recognized UMB Bank as one of the best run banks in America for five consecutive years. While at UMB, Tom was responsible for fostering business growth through consumer services, wealth management, commercial banking, fiscal activities, risk management and human resources for Missouri, Kansas, Oklahoma, Nebraska and Greater St. Louis, including both Missouri and Illinois. Tom launched and managed industry verticals in Agri-Business & Healthcare growing the Agri-Business vertical from an ABA national ranking of 49th to the Top 25. Tom has also championed innovation and workforce development, especially in the financial sector. He instituted, monitored and mentored investments in the 630 FinTech Accelerator, led the company in highest Customer and Associate Satisfaction scores, and earned the UMB Financial Corporation Leadership Award, the highest company honor. Tom currently serves on the Board of Trustees for Webster University and the Board of Directors for The Regional Business Council and the St. Louis Sports Commission. He has formerly served on the Board of Directors of the St. Louis Zoo, the St. Louis Area Council of the Boy Scouts of America, and Saint Louis University John Cook School of Business. St. Louis’ limited public transportation infrastructure is often cited as a barrier to accessing employment opportunities, health care, education, and cultural experiences throughout the region. Many of our young people, especially those living in underinvested and isolated neighborhoods, are growing up a short car ride away from community assets they may never be able to access. As the region frets about the looming skilled worker shortage and the current workforce limitations that left the region uncompetitive for the Amazon expansion, we know we must invest now in the untapped potential of our region’s youth to ensure they are career-ready. Our teens and young adults need opportunities to be exposed to professional environments and develop job skills under the mentorship, supervision, and support of caring adults. A number of youth employment organizations recruit, train, and place young people in businesses throughout the region. However, inability to pay for transportation keeps many young people from accessing these career-building opportunities that can set them on a path to financial sustainability. The STL Regional Youth Employment Coalition (RYEC), a newly formed partnership of 15 employment organizations in the region, has been collaborating to identify a solution to this issue. Partners around the table have shared data to better understand the geographic concentration of youth placements for their eight-week employment opportunity (Figure 1). Originally, it was assumed that most of the young people originated from St. Louis City and North St. Louis County and were placed in summer employment opportunities in West St. Louis County and in St. Charles. The data collected contradicted this by demonstrating that youth were primarily employed in the Central Corridor, a part of the region that’s highly accessible thanks to public transportation. With regular Metro pricing, young people would have to pay about $160 to access public transportation for the duration of their summer employment—about 10% of their entire potential earnings for a summer. Some existing programs have supported young people by providing a week’s worth of passes, but the rest of the cost was left to youth to carry. Armed with this information, RYEC advocated for reduced transit fare pricing for youth to ensure that transportation was no longer a barrier to accessing summer employment. As a result of this advocacy, RYEC was selected as a sub-pilot leader of the Gateway Go Program, which provides half-fare transit access for youth ages 13 to 25 thanks to a partnership between the City of St. Louis, St. Louis County, St. Clair County, the St. Louis Economic Development Partnership, the St. Clair County Transit District, Bi-State Development, and Metro Transit. As part of this pilot, RYEC coalition partners pooled resources and leveraged a Wells Fargo Advisors investment to provide free Gateway Go Cards for 435 young people. These Gateway Go Cards were loaded for unlimited use during their two months of summer employment. Collectively, these young people used their Gateway Go Cards a total of 20,042 times. Nearly all youth indicated that having the Gateway Go Card made it possible for them to get to work and that they were satisfied with their experience using their cards. Many were also able to use the cards for non-work-related commuting, opening up opportunities for them to fully explore our community. The St. Louis Regional Youth Employment Coalition is committed to reducing transportation as a barrier to employment. During the summer of 2019, RYEC plans to provide even more youth with loaded Gateway Go Cards and empower them to take advantage of economic, educational, and cultural opportunities that will prepare them to be our region’s future leaders. Bi-State Development and the City of St. Louis are currently evaluating the pilot with some support from RYEC to obtain youth feedback. As of right now, half-fare transit pricing for youth has only been extended through September 30. To ensure that Gateway Go continues to expand access to opportunity for our region’s youth, we must advocate for the program’s permanent continuation. As a regional stakeholder, you have a role to play in ensuring youth have better access to jobs and opportunities to explore our community. If you share our belief that our region can and must do more for its young people, we invite you to contact Mayor Krewson’s office today and share your strong support for the continuation of the successful Gateway Go Pilot and expanded mobility for our region’s youth. Together, we can make sure that tomorrow’s leaders have access to the opportunities they need to learn, grow, and connect with the community today. Nataly Garzon is committed to ensuring racial equity in opportunity. She graduated from Williams College in 2014 with a degree in History and Political Science. Since graduating college, Nataly has worked for two collective impact efforts. In Massachusetts, Nataly lead coalitions working on decreasing the county’s teen birth rate, decreasing youth substance and alcohol abuse, and increasing the high school graduation rate. After three years in Massachusetts, she moved to St. Louis and joined the Ready by 21 St. Louis team in June of 2017. In her role as Specialist, Systems Change Strategies, Nataly spends her time supporting efforts within the space of Social Emotional Learning, and has been standing up the STL Regional Youth Employment Coalition since early 2018. The STL Regional Youth Employment Coalition, a cross-sector collaborative with a footprint of St. Louis City and St. Louis County with a racial equity lens, is committed to fostering economic empowerment and strengthened quality of life through an equity lens by increasing youth employability, growing a diverse talent pipeline, and impacting systemic change. For 2018-2020, the coalition is focusing on increasing the quality of pre-placement training for youth employment programs, coordinating youth wraparound support for youth in these experiences, and developing an intentional coordinated referral system to credential and apprenticeship training opportunities for youth 14-25 in their footprint. Since she was a teenager, Nataly has fundamentally believed that youth of color deserve to have the tools at their disposal to succeed as they define it. It is because she holds this value close to heart that she has pursued her current role, and is deeply passionate about her role through Ready by 21. In July the Bel-Nor Board of Aldermen crammed into their tiny meeting room with about 25 residents, both black and white. The discussion centered on the tiny North County town’s decision to combat deteriorating properties with an aggressive inspection program that would result in citations and possible fines if the required repairs were not completed by early fall. The Bel-Nor Board of Aldermen welcomed various opinions. They are trying hard to protect the beauty and future of the community. The feeling was, this strategy is the best way to protect a town that’s withstood decades of decline experienced by nearby North County towns. Most at the meeting were in favor of the fines, saying people had to be responsible, just like everyone else. Others remained quiet. There is no extension option built into the process. So, if you need more time to raise the cash to make the required repairs, there’s no way to appeal the city for an extension. Instead, they were reassured by a Bel-Nor police officer that if you had to go to court, the judge would show leniency if you were making progress. Bel-Nor told me my house needed some paint. No argument there—it does. And I’m sure my neighbors think so, too. I’m not yet sure how much that is going to cost. The problem is that I have little saved for that project and no equity in my house to borrow money at a low-interest rate, so I’m not sure where the money is going to come from if I want to stay out of municipal court. And I’m sure there are several people in the community who are in the same situation. Surely, there has to be a better way for diverse communities struggling with housing values in North County than punishing its residents for financial factors out of their control. In April, my mentor and colleague Dr. Jason Purnell of Washington University wrote about creating consciously inclusive communities—one of 11 recommendations in the report “Segregation in St. Louis: Dismantling the Divide.” He urged people to consider diversity and inclusion as assets that could stabilize and strengthen communities. Indeed, neighborhoods that were welcoming to all and created supportive systems for everyone could chip away at a century of policy promoting racial segregation. Bel-Nor is an outlier when it comes to our region’s pervasive problem of black and white segregation. The town is about 48 percent African-American and 46 percent white. It’s not like some “diverse” towns or neighborhoods where whites and blacks don’t live on the same streets. African Americans and whites truly live side-by-side in Bel-Nor. But, Bel-Nor is struggling to stay solvent, and some of its residents are struggling too. When the Great Recession hit, Bel-Nor took a hit in housing values. After Mike Brown was killed, Bel-Nor took another hit. A few walked away from their houses because they were tens of thousands of dollars underwater. A man down the street lost his home to the bank and stripped out all of the crystal doorknobs and the Central AC compressor on his way out the door. Opportunistic landlords swooped in on depressed home values and converted houses into student rentals. And, some housing declined. Indeed, all of these factors point to the possibility that Bel-Nor, though diverse and blessed with beautiful housing stock, could transition to another poor North County disinvested community. I love my town, and I don’t want this to happen. I want it to remain diverse. I want it to remain pretty and maintained. And I want it to thrive. Preserving the housing is critical. But I don’t want people ostracized in the process. I want people to feel included and part of a real community. At this meeting, I asked the group to consider doing away with punitive fines and consider more inclusive, supportive and creative solutions that don’t ostracize its vulnerable residents in the courts—or put others in jeopardy of leaving or walking away. I urge them to keep thinking about this. This could include working more closely with homeowners on tiered improvement plans so the repairs get done over time. Better partnerships with families could help them find needed credit and resources. Even creating a swap system of yard and exterior upkeep work between families with different skills could help. Or, the Board of Aldermen could actively lobby on the recommendations in “Segregation in St. Louis: Dismantling the Divide.” They include St. Louis County establishing an Affordable Housing Trust Fund. Or the creation of a Greenlining Fund so people can borrow money to improve under-appraised homes. They could consider applying for support for home stabilization through community reinvestment groups. And they could start talking about how our differences make us stronger if we stick together. Neighborhoods certainly benefit from well-maintained housing, and Bel-Nor leaders are tackling hard issues. But better policy and inclusive and caring relationships can also build strong, stable communities. There is a better way if we start demanding it. Nancy Cambria is the communications manager for Health Equity Works, formerly named For the Sake of All. She was a lead author of the recent community report Segregation in St. Louis: Dismantling the Divide. Prior to joining Health Equity Works, Cambria was the children and families reporter for the St. Louis Post-Dispatch for more than a decade. Her reporting focused heavily on children in poverty, child trauma and early childhood quality and safety. Humans are a social species. The need for trust is rooted in our DNA. In times of peril and uncertainty, trusting relationships provide a sense of security. Trust helps us to survive. In 2014, during the Ferguson unrest, I was a police officer in St. Louis, assigned to a special unit focusing on low-income housing projects. Dirty stares and middle fingers were testaments to the trust we’d lost. The city was on the verge of erupting. One evening, I handcuffed a man on his front porch for unlawful use of a handgun. I didn’t notice the angry mob forming behind us. “Leave him alone,” someone yelled. Angrier words followed. You could feel the tension in the air. And it was true. I did read to students. My unit also sponsored movie nights and back-to-school giveaways. At Halloween, we hosted “Trunk or Treat.” We invested in community relationships. The community didn’t forget. Her plea worked. The crowd lost its steam. These problems began long before the shooting death of Michael Brown. The DOJ report highlights a 2013 encounter between a Ferguson patrol sergeant and an African-American man. The sergeant, though he could not articulate a reasonable suspicion, detained the man after seeing him talk to an individual in a truck. When the man refused to allow the sergeant to frisk him, insisting that had committed no crime, the sergeant became infuriated and drew his Taser. Video captured by the Taser’s built-in camera shows that the man made no aggressive movements. Still, the sergeant fired, knocking the man to the ground. The sergeant then fired again, later claiming that the man had attempted to stand. But the man never tried to stand, as the video makes clear. He just squirmed in agony. Each year, similar reports flood the DOJ’s Civil Rights Division. Victims hope for protection and understanding. Police misconduct is a betrayal of trust. Distrust is not simply the absence of trust: Both are rooted in neurobiology. Feelings of trust flow from the prefrontal cortex, which compares the present to past experiences. Feelings of trust release oxytocin and dopamine, which increase energy and a sense of belonging. Feelings of distrust trigger the amygdala, which controls our “fight, flight or freeze” response. Together, these brain structures dictate our perceptions of reality, which is why regaining lost trust can be so difficult. Once the amygdala is engaged, new experiences invariably mix with old narratives of hurt and disappointment. But it is possible to regain trust, as Ferguson Police Chief Delrish Moss, who was appointed in 2016, is now demonstrating. From the ashes of unrest, Moss has implemented a community-first philosophy. Every member of the department must meet with members of the community. Officers are rewarded for positive interactions, from organizing kickball tournaments to treating high school students to a special “Black Panther” premiere. The promotions process has been revised. Chief Moss also emphasizes that social media, properly used, can help to humanize officers. Specialized units are creating content for the department’s Facebook and YouTube pages. Videos provide friendly tips for public safety and exclusive behind-the-scenes looks at department operations. Effective policing requires social trust. The Ferguson Police Department is rebuilding the trust it had lost by tapping into a simple but powerful human need: the need to belong. Luther O. Tyus is a Graduate Research Assistant at the Brown School at Washington University, as well as an eight-year veteran of the St. Louis Police Department and a certified POST police instructor. Luther has published and commentated for CNN, Headline News, and St. Louis Post Dispatch. Luther has delivered a one-hour Crime Prevention presentation to numerous corporations, including ten to AT&T and several to Ameren UE. He has conducted his Social Unrest seminar for the NAACP, Urban Strategies, FOCUS St. Louis, and The Urban League. Next Tuesday, August 7, St. Louis County residents will go to the polls to decide between two leading candidates in the Democratic primary for St. Louis County Executive: incumbent candidate Steve Stenger and his chief challenger, businessman Mark Mantovani. Voters were recently denied an opportunity to listen to these candidates exchange an open dialogue on a range of important issues facing our region. As a public ethicist, a civic engagement advocate, and a U.S. citizen, I find this deeply problematic, and symptomatic of a wider trend of non-engagement, especially among incumbent candidates. For the past year, I have been a part of the Social Policy & Electoral Accountability Collaborative (SPEAC), a group facilitated by the Community Builders Network and comprised of leading St. Louis area organizations striving to hold elected officials accountable to the communities they represent, or are seeking to represent, both prior to an election and afterward. In February 2017, SPEAC hosted one of the largest mayoral forums in the City of St. Louis, held at the Sheldon in partnership with St. Louis Public Radio, the Nine Network, and The St. Louis American. Over 700 people gathered to hear mayoral candidates discuss their priorities on live television before the March primary, a race that—as will likely be the case with next week’s primary in the County—effectively determined the outcome of the subsequent general election. SPEAC has spent the past ten months planning a similar forum for the County Executive race in St. Louis County, originally set to be held on July 25 at the Touhill Performing Arts Center on the University of Missouri-St. Louis campus. As we did last year, our group was working with journalists at St. Louis Public Radio to craft questions that would have explored where candidates stand on priorities at the heart of the Ferguson Commission Report under the Youth at the Center, Opportunity to Thrive, and Justice for All issue clusters. Mark Mantovani agreed to take part in SPEAC’s forum. However, despite repeated, multi-pronged outreach attempts over time, County Executive Steve Stenger’s campaign failed to confirm his participation. As a result SPEAC was forced to cancel the event. As someone who worked hard in partnership with a coalition of incredible St. Louisans who are passionate about building a stronger, more equitable, and more just region for all, I was very disappointed in this result. As Forward Through Ferguson’s David Dwight noted in SPEAC’s press release about the forum cancellation, “there are few things more core to the health of our local democracy than the right of residents to interact with those who seek to represent our community in public office.” Indeed, this is the very glue that holds a democracy together: a genuine belief that our elected representatives and public institutions will take our viewpoints and our needs into account in a real, substantive way when they craft policy and make decisions. Without that foundation of accountability, transparency, and trust, democracy can’t exist. To read SPEAC’s full announcement about the forum cancellation, click here. Dr. Wally Siewert has over a decade of experience with civic and political engagement, from the grassroots and applied level to academic analysis and theory. From 2011-2017, Dr. Siewert was the Director of the Center for Ethics in Public Life (CEPL) at the University of Missouri-St. Louis. During that time CEPL established itself as a statewide hub for public ethics information, conferences, workshops, research, best practices, legislative tracking, community collaboration and more. Prior to arriving in St. Louis in 2011, Wally earned his Ph.D. in political philosophy and ethics from the University of California Santa Barbara. He also holds an M.A. in philosophy and a B.A. in philosophy and German from Western Michigan University. Prior to his post-graduate work, Dr. Siewert worked as a political organizer and lobbyist for a network of state-level grassroots consumer justice organizations, including two years as the Campaign Director for the Coalition for Consumer Justice of Rhode Island. He also spent four years as a small business owner and manager. Dr. Siewert’s most deeply held political beliefs are not about policy, but about political process—about what it takes to create cooperation among co-citizens while simultaneously respecting every individual’s right to pursue her own personal conception of the good. He is an avid wood-worker and animal lover who enjoys nothing more than a good game of chess with a purring cat on his lap and a dog on his feet.